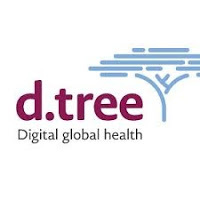 D-tree International is a digital health organization with 15 years of experience using innovations in technology to strengthen the quality of health systems in low and middle-income countries. D-tree works through partnerships with Ministries of Health and NGOs to bring human-centered design approaches to collaborations in which we support partners to define key programmatic challenges and priorities, explore if and how technology can be used to improve program efficiency and quality, and then work with our partners to choose the most appropriate technology platform to meet their needs. This may include using or building on existing tools, or configuring new solutions through a variety of software platforms. A key aspect of our work is our end-to-end partnership, in which we also support partners to use systems thinking to roll out, implement and monitor programs and facilitate a culture of data use among multiple stakeholders. D-tree has received funding from USAID, the Gates Foundation, Rockefeller Foundation, Foundation Botnar, Human Development Innovation Fund, Packard Foundation, UN Foundation, and more than 20 international NGOs. As a pioneer in the field of digital health, D-tree has supported more than 8,000 health workers serving over 5 million families in 16 countries throughout sub-Saharan Africa and Asia. Evaluations have demonstrated improved health impact through D-tree’s digital programs, including 27% reduction in maternal mortality, 50% increase in facility delivery rates, four-fold increase in postpartum follow-up, 70% increase in contraceptive prevalence rates and 15-fold improvements in health worker performance. We have been working in Tanzania since 2008 on a variety of digital health projects focused on improving the quality of healthcare delivery through the introduction of innovative technology and processes. A core aspect of our work is engagement and integration with government health systems and other stakeholders working in the digital health space. Our portfolio is growing and we have an exciting opportunity to work with a multi-disciplinary consortium of partners to develop and implement an innovative digital health system to strengthen referral coordination and care provision across the continuum of care through the primary health system through the upcoming ‘People-Centered Care’ project. This will include the development of a comprehensive digital system to improve decision support, referral coordination and data sharing across community health workers, drug dispensers and primary healthcare facility. The system will integrate biometric identification and artificial-intelligence-based decision support to assess how emerging technology can improve coordination and healthcare delivery across various touch points within the health system. This work will be strengthened by ethnographic research, human-centered design processes and close collaboration with the government to maximize learning and set the stage for further adoption and scale-up. We are seeking a full-time Program Director, based in Dar es Salaam, Tanzania, to lead the Mainland Tanzania office, which includes leading business development efforts, representing D-tree broadly, overseeing select programs, and serving as a resource to project managers across the Mainland portfolio. You are someone who is passionate about leading teams and supporting capacity building of staff. You are comfortable and confident in high-level meetings with government and NGO partners, and you enjoy developing and executing program plans and strategies to grow the portfolio and reputation of the organization. You are a strong public speaker and have the ability to clearly articulate program updates or solicit input from stakeholders. You are detail-oriented, but also able to see the big picture and design mid to long-term strategic plans. This is a dynamic, challenging and rewarding role requiring an individual with extensive experience building and inspiring teams, working with the Tanzania government and partners, and managing projects. You will be a key member of the D-tree team globally and will lead the Mainland Tanzania office, supporting a team of 5-7 staff. You will work closely with the Regional Program Director (based in Zanzibar) to strategically represent D-tree and engage with the government and key stakeholders for D-tree programs in Tanzania. This will include representing D-tree as a co-chair of the mHealth Community of Practice, a group which brings together implementing partners and the government around digital health. You will also oversee upcoming projects, working closely with the Regional Program Director and project team. Working with D-tree’s Director of Business Development & Partnerships (based in the United States), you will design and implement a business development plan with targets for D-tree’s pipeline within Tanzania. Finally, as part of your role you will stay up to date on current trends in digital technology and innovation to improve healthcare delivery, both within Tanzania and globally, in order to inform D-tree’s growth. Working closely with the Project Manager, manage projects across the Mainland Tanzania portfolio, including general administration, information management, and budget monitoring and compliance with donor agreements. Monitor and report on progress on all project objectives; ensure staff and partners are kept on track to achieve results. Support writing work plans and reports for donors and the Ministry of Health. Work with D-tree’s Director of Business Development and Partnerships to contribute to and execute a business development strategy for the Tanzania office based on D-tree’s vision, strategy, and mission. Identify new donor funding opportunities and partners, and collaborate remotely with the Director of Business Development and Partnerships to identify and vet new business opportunities and develop value propositions on where we can help solve challenges. Lead meetings with potential partners and funders in Tanzania to understand programmatic challenges and needs and propose ways that D-tree can support and provide value to their work. Provide input on proposals or new project plans and elicit input and approval from government counterparts. Maintain strong relationships with existing partners and funders. Lead the D-tree Tanzania team in working closely with national, district, and local government counterparts to foster government engagement in D-tree programs. Co-lead the Tanzania mHealth Community of Practice. This will include organizing meetings with COP co-chairs, organizing quarterly COP meetings with all members, and liaising frequently with the government to ensure strong support for government priorities in digital health. We are looking for a motivated, passionate individual who is willing to wear multiple hats and do what it takes to support D-tree’s continued growth and quality. The following attributes are a general overview, but we will consider individuals who do not meet all of the details below if you have the right skill set and attitude. Experience with business development including fostering and maintaining relationships with partners and donors; writing concept notes and proposals; and proactively seeking opportunities for new engagements. A can-do attitude: You remain optimistic in the face of adversity and creatively solve problems to get things done. A systems thinker: You are able to understand linkages and interactions between individual components in a health system, and design solutions to strengthen the overall system. An innovator: You enjoy thinking outside of the box and want to use that thinking to solve pressing global health problems. A detail oriented & strategic thinker: You pay attention to small details and focus on quality and consistency, but also have the ability to see the big picture and think strategically. Cover letter, clearly and concisely explaining how you would add value to the D-tree team. A writing sample demonstrating your ability to communicate effectively in writing. Your current Curriculum Vitae (CV) or resume, showing your work history. This position is open to Tanzanian nationals only.